How is the Gastronomy in Ecuador? If you’re a fan of food, traveling and trying new things, then gastronomy is likely one of your passions. Gastronomy is the interconnected relationship between food and culture and Ecuador is no different. In Ecuador, food is an integral part of the culture. No matter where you’re from, traveling to Ecuador is an exhilarating experience. There are beautiful sights to see, fascinating traditions to observe and- most importantly- delicious food to taste. However, Ecuador isn’t as popular of a tourist destination as many other South American countries. But why is that? Ecuador is country rich in culture, food and adventures. What many don’t realize is just how diverse of a country Ecuador truly is. Ecuador is comprised of four major regions: The Pacific Coast, The Amazon Region, The Andes and The Galapagos Islands. In regards to gastronomy, popular dishes- and how they are prepared- vary from region to region. However, no matter where you are in Ecuador, the food is always rich, spicy and full of flavor. Humitas are renowned as Ecuadorian comfort food. They are typically made during the colder months and are similar to Mexican tamales. However, humitas have been around since pre-hispanic times and are slightly different than tamales you may be used to. Humitas are made of corn, eggs, cheese and cream and are served wrapped in a corn leaf. Humitas are usually eaten in the morning as breakfast with a glass of fresh fruit juice and a cup of haba coffee. Seafood is very popular in Ecuador, which could explain why cangrejada is such a common Ecuadorian lunch dish. Cangrejada is a dish made with red mangrove crab that is popular in the coastal regions. While this dish may be hard for some visitors to comprehend, it is a huge part of Ecuadorian culture. Cuy is what Ecuadorians call the South American guinea pig dish that they consider a delicacy. The taste of cuy is similar to chicken wings and many visitors who have tried the dish have enjoyed it. “Paila” is the word for the skillet that is used to make this scrumptious ice cream. Paila ice cream consists of a pureed mixture of sweet fruits and is a traditional dessert in Ecuador. Let us know your budget, and we can build a tailor-made tour for you. Gastronomy in the pacific coast of Ecuador is heavily seafood-based. Its close proximity to the ocean, as well as the delicious crustaceans that live in the sea off of The Pacific Coast, means that you have to love seafood if you visit this region of Ecuador. Shrimp is popular in the area and is often made into soups and stews like al ajillo, ceviche and biche de camaron. Lobster is either baked with garlic and tomato or incorporated into spaghetti. In addition to delicious seafood dishes, foods like fried plantains, rice and coconut milk are everyday staples in The Pacific Coast. Due to its lush and humid environment, The Amazon region of Ecuador has an especially unique gastronomic culture. There are foods available in the amazon that are either unavailable in other locations or simply much better. One of the region’s traditional dishes is stewed guanta. Guanta is a large rodent found in the region and it is served in a stew with beef, banana, garlic and rice or potatoes. 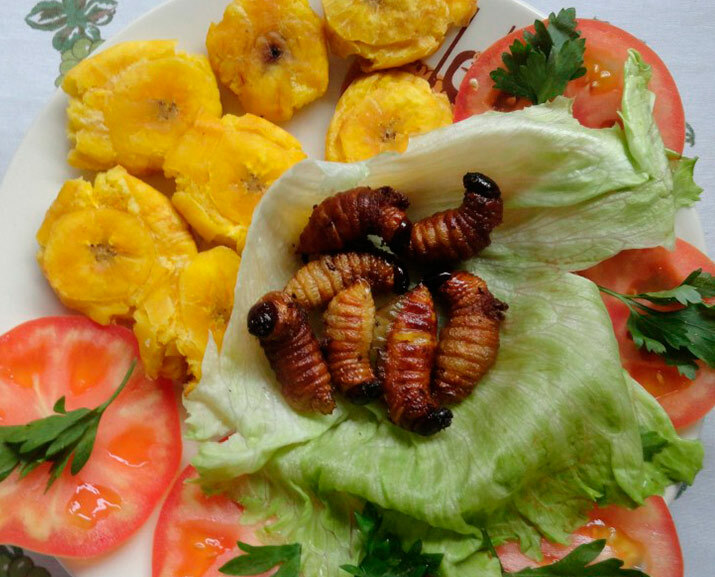 Chontacurro, a dish made with the curro worm, is also a favorite in The Amazon region. This worm is served with rice and banana and is sometimes eaten alive! Other meats eaten in the area are turtle, monkey, and snakes. Aside from the exotic meats, the unique gastronomy in Ecuador’s Amazon region includes a plethora of unique fruits. Arazá, cocona, borojo and chonta are just a few of the kinds of exotic, juicy and absolutely delicious fruits that make up part of the gastronomy in Ecuador. The Galapagos Islands is one of the most famous locations to visit in Ecuador. While it is well-known thanks to its incredible biodiversity and stunning sights, it also has its own unique gastronomy. The enchanted islands are famous among foodies for their gourmet seafood dishes and beautiful food preparation. “Langosta,” or lobster, is a common delicacy in The Galapagos Islands. Caviar, special sauces and rice compliment its unique texture and flavor. However, it’s important to note that lobster season is between January and June, so make sure to visit during those months for some of the most mouth-watering lobster you’ve ever tasted. Shrimp is another staple of gastronomy in Ecuador when it comes to The Galapagos Islands. Shrimp is either eaten alone or in traditional dishes like ceviche or seafood rice. Seafood rice is a delicious combination of mussels, vegetables, shrimp and spices like coriander and garlic. Many visitors to the islands are shocked to learn that it has some of the most delicious coffee in the country. Coffee in The Galapagos islands is rich, organic and some of the most expensive in the entire world! “El Cafetal” is definitely something that you’ll want to try while you’re in Ecuador. Because The Galapagos Islands have been declared a world heritage site by UNESCO, its vegetation grows freely. Juicy, exotic fruits like guava and papaya can be found hanging from trees on the island. At Latin Trails, we believe that everyone who visits Ecuador should receive a warm welcome and have a unique, personalized experience. That’s why we are so passionate about creating a variety of tours that suit each and every tourist who comes to Ecuador. Lucky for all foodies out there, we even have a gastronomy tour! Gastronomy tours in Ecuador are designed for visitors who have a fascination with both food and culture. Ecuadorian cuisine is known for the incorporation of native ingredients and the unique history of each and every dish. Gastronomy tours in Ecuador by Latin Trails allow participants to visit a bevy of high-quality hotels and restaurants to try a wide variety of Ecuadorian dishes. Every tour is planned so that participants are taken on a comprehensive and continuous journey through gastronomy in Ecuador. From the time they step foot off the plane, participants will begin experiencing the unique flavors and foods in the country. Starting in the Andes, the official gastronomy tour will introduce visitors to traditional potato tortillas, hornado (grilled pork) and agrio (a tasty sauce made of mixed herbs). While in the Andes, tour participants will also have the chance to experience unique activities in a breathtaking location surrounded by mountains and paramos. Organic food, rose gardens and old haciendas are all highlights of the Andes. From the Andes, the tour will travel to the coast to experience high-class restaurants and luxury spas. Boutique hotels and classy restaurants will be where tour participants will try the cuisine of the Pacific Coast. Most of the cuisine in this region incorporates seafood, such as crab and ceviche. Ceviche is a seafood, tomato and lime soup typically served with fried corn. However, breakfasts feature sweet and savory foods like fried plantains and bolones. These are just a few ideas of what tour participants can expect to experience, taste and learn while on one of our famous gastronomy tours in Ecuador. Tours will also stop by annual Ecuadorian gastronomical fairs to enjoy popular regional cuisine and purchase organic products. As you can see, the gastronomy in Ecuador is a fascinating part of the country’s history and social scene. When you visit a new country, you may be most excited about seeing the architecture or going on adventures, but the gastronomy of a country is just as fascinating to learn about. In Ecuador, you could try foods and flavors that you would never be able to taste at home! If you are particularly interested in the connections between food and culture in Ecuador, why not go on one of the famous gastronomy tours in Ecuador? They are truly the best way to experience the gastronomy in each of Ecuador’s four regions. The last thing that you want to do is deprive yourself of an eye-opening culinary experience! The gastronomy in Ecuador could change how you see the entire country!